Matthew Fagan and Chris Finnen will be coming to Emerald in May. 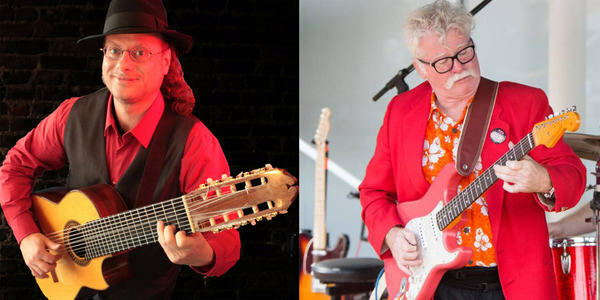 Guitarist Chris Finnen will join one of Australia’s finest guitarists, Matthew Fagan at the Gemco Players Community Theatre in Emerald for the “Roots Music of the World” spectacular on Friday 10 May. Taking audiences on a journey, guests will be treated to some of the most traditional music, from soulful Delta Blues and Roots music to the Spanish gypsy fire of Flamenco. The duo will perform on a range of guitars including the National Resonator, Celtic Steel String and the Fender Electric Stratocaster. Mr Finnen has performed for the Dalai Lama and has shared the stage with some of the biggest names including Buddy Guy, Bo Didley and Jimmy Witherspoon. He was inducted into the New York Blues Hall of Fame and in 2014 was inducted into the Adelaide Music Collective Hall of Fame. Lovers of all things guitar and Roots Music will be enticed by the two greats and are invited to attend the show with doors opening at 7pm. Tickets can be booked online or at the door subject to availability. More information can be found at https://guitarspectacular.eventbrite.com.